The ability to wake someone from a coma is pretty damn amazing. It will be tough, though, and it will be a lot of work. So much work, in fact, that Plaid Hat’s Comanauts spans eleven comazones, each linked to a period of comatose Martin Strobel’s life. Each zone also has one of Martin’s inner demons that may be responsible for his current state. Not only will you have to find Martin inside his own mind, you’ll have to learn how to navigate between the zones before you even have a chance. 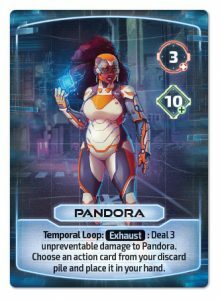 Are we done with Guardians hero previews already? Well, yes and no. The base game is out, so there won’t be more previews for it. But the Uprising Hero Pack is coming, and here we have two of its four heroes. Chamber is defined by his Hit and Run ability: after an opponent takes damage Chamber may move to a different location. He’s also the first character to use the new Blast Damage mechanic. Pandora is a time traveler. In Guardians that means she can recover cards from the discard pile or, with her ultimate ability, take an extra turn. Vejen, the second game by German publisher Spielefaible, will confront you with a problem games usually gloss over: Exchange rates. They’re not the only thing to worry about in a game where you build trading houses and try to balance supply and demand between the villages you trade in. However, those villages being on both sides of the border between Germany and Denmark, you do want to keep an eye on the exchange rates. The fifth and final expansion for Starling Games’s King’s Forge is now on Kickstarter, and pleasing the King with the items you craft will be harder than ever before. King’s Forge – Masterworks comes with 22 new items from all over the world for you to craft. That’s far from everything, though. This expansion also brings visitors from all over the world, visitors that will gladly help you out in your crafting quest once per round. New materials, meaning new kinds of dice, are also included. Exotic materials include Grimstone, residue from witches’ cauldrons giving random bonuses, and Heartwood, the only kind of dice you don’t roll. Instead, the growing Heartwood tree increases in value each turn. The successful King’s Forge formula stays the same, but Masterworks gives you plenty of new options to explore. 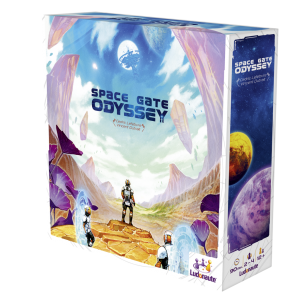 I can’t say all that much about Space Gate Odyssey from Ludonaute’s first post about it. You’ll colonize five exoplanets, using teleportation gates to get there. Each planet somehow scores points in a different way based on its arrangement of landing sites. So far I can have a clue how the game will play. But then you also need to build the space station from where your colonists will enter the gate. How quickly you can channel colonists through the station seems to be important, but somehow the modules used to build the station also influence the final score. That’s the point where I want to play Space Gate Odyssey to see how it fits together.